We offer the secure and safe RV Title Loans Chandler trusts! RV Title Loans have always been a great way to get some extra cash in Chandler. At our RV Title Lender, we offer cash loans on all makes and models of Recreational Vehicles, as long as it has a valid Arizona Title. If you have an RV and the title, and need a title loan, than our services may be right for you. Well, we are able to make RV Title Loans without a credit check or background check through our pawn shop in Chandler. Whether you have bad credit, or no credit, we can get you a loan you need tailored to your situation. The way it works is very simple, just simply bring down your RV and title and one of our trained, knowledgeable associates will appraise it based on condition. We use strict guidelines from 3rd parties such as NADA and Kelly Blue Book, so you know you’re getting a fair appraisal. After that, we’ll make an offer to you with which you can either take the full amount towards an RV Title Loan, or you can only ask for what you need. Afterwards, you get your cash, and can still drive away with your RV. The process is quick, painless, and gets you immediate cash when YOU need it. Simply make monthly payments towards the interest to us, and pay off the amount when ready. At the best pawn shop this side of Chandler, Gilbert, Queen Creek and Mesa, we care about our customers and will do everything in our power to ensure you’re getting the maximum amount of cash you deserve for your RV title loan. Come and visit today, and see why Oro Express Chandler Pawn & Gold is the number one pawn shop in Chandler, Gilbert, Mesa, and Queen Creek, and the best place to get quick cash with an RV Title Loans. Still Want More Details on RV Title Loans? Let’s get into specifics, then! First and foremost, our title loans are done through Phoenix Title Loans. They themselves have eleven valley wide locations and have been servicing Chandler, Queen Creek, and Gilbert for well over a decade. There’s lots of steps to getting an RV Title Loan so let’s break this guy down into sections. Many title loan lenders don’t discuss how they come up with their numbers for loan amounts, but at Oro Express Chandler Pawn and Gold we believe in full transparency. While it’s simple to just use KBB or Nada market values, we include a lot of different metrics outside of this. We evaluate very closely the exterior and interior condition of the RV, as well as its operating condition. We’re specifically listening to see if it’s making funny noises, or if it’s blowing smoke, or maybe running hot. We then consider this when pricing out the loan to pay different percentages of the overall value. On top of this, we can consider other metrics that traditional loan institutions use. For our RV Title Loans, if you’re perhaps looking for more than the amount we initially offer you, we can look at things such as credit score, income levels, and other factors. When we talk about credit score, we’re happy to run it to look at your history of repayment and perhaps give you more title loan cash. When we talk about income, we can check pay stubs and also what field you work in for stability. Lastly, if you have a spare key we can offer you even more money and on top of that, if you choose to store it in our safe, secure facility we can offer even more on top of that. Interest rates are also a factor rarely discussed, but at Oro Express Chandler Pawn and Gold we have tons of ways to get you a lower interest rate. 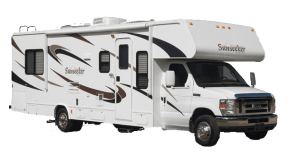 This is one of the most important port ions of the RV title loan process as it can stack up quickly if you fall behind on it, or if you instead are given an exorbitant interest rate by a previous title loan lender. The biggest way for you to save money in Chandler, Gilbert, or Queen Creek, on your RV Title Loan is through taking less money than we offered, giving you a lower loan-to-value ratio. Often you don’t need the full amount of the title loan anyway, so why not take less and save yourself some money? The other very important thing here is to only take the amount of money that’s absolutely necessary for your bills. While most of the time, we’re able to offer more than what our customers actually need, it’s not advisable to take this full amount. Interest is always calculated off of your principal balance which means the more money you borrow, the more your monthly payment is each month. It’s always tempting to take more, and you’re welcome to, but an auto title loan should always be a short term solution so it’s best to keep it as short as possible. If you’d like to see a breakdown or want help evaluating what options are truly best for you, feel free to reach out to us. We’re not just here to make money off you, but to help, and will do anything in our power to that end. Use our Online Application or our live chat right at the bottom of the screen and we’ll get back to you the same day with the options available to you. It’s important to remember that this list is nowhere near extensive. The beauty in an auto title loan is it’s based on collateral and not all the other silly metrics that traditional loan institutions like to use such as credit scores, references, income and all that jazz. Now, obviously, some of these metrics can help with some of your RV title loan terms, but they’re nowhere near a requirement. An auto title loan is a form of collateral loan in which the loan amount, and our ability to actually make the title loan, is dependent on your RV. We use many metrics to determine this such as mileage (dubiously), interior and exterior condition, and can include things like credit scores into the process if need be. We offer the best rates for RV Title Loans in Chandler, and also serve Mesa, Tempe, and Scottsdale. Have unanswered questions? Check out Phoenix Title Loans, LLC’s awesome page for more on RV Title Loans!